There is no civilian employment more dangerous than railroads. All too frequently, accidents result in fatalities and career-ending injuries. Seven SMART Transportation Division members lost their lives on duty in 2018. To combat the unacceptable loss of life and career-ending injuries among SMART TD members, former President Mike Futhey appointed a Rail Safety Task Force charged with creating action alerts to reduce rail-employee risk while on the job. Leading the task force is SMART Transportation Division Georgia State Legislative Director Matt Campbell, who is working with Washington State Legislative Director Herb Krohn and Pennsylvania State Legislative Director Paul Pokrowka. “The task force works with other state legislative directors, general chairpersons, the FRA and carriers in seeking to identify and communicate best practices and techniques to improve situational awareness and keep situational awareness at its highest level,” Futhey said. 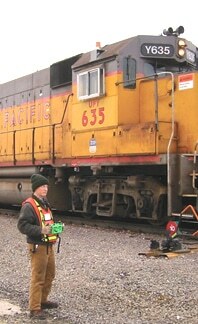 The task force also coordinates with the Transportation Safety Team (which assists the National Transportation Safety Board (NTSB) in post-accident investigations) and the Switching Operations Fatality Analysis (SOFA) Working Group, which works with the FRA and carriers to develop safe practices to reduce switch-yard accidents, fatalities and injuries. The Rail Safety Task Force is most interested in receiving comments from Transportation Division members working in yards and aboard trains. The contact information below permits members to communicate concerns and suggestions directly to the task force.